SAN DIEGO, CA -- In early July, Betsy Davis emailed her closest friends and relatives to invite them to a two-day party, telling them: "These circumstances are unlike any party you have attended before, requiring emotional stamina, centeredness and openness." 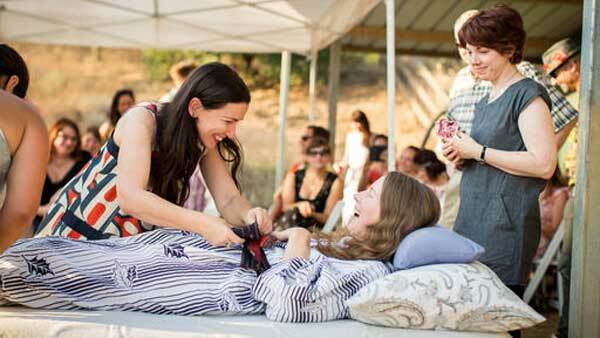 The 41-year-old artist with ALS, or Lou Gehrig's disease, held the gathering to say farewell before becoming one of the first Californians to take a take a lethal dose of drugs under the state's new doctor-assisted suicide law for the terminally ill.
"For me and everyone who was invited, it was very challenging to consider, but there was no question that we would be there for her," said Niels Alpert, a cinematographer from New York City. "The idea to go and spend a beautiful weekend that culminates in their suicide - that is not a normal thing, not a normal, everyday occurrence. In the background of the lovely fun, smiles and laughter that we had that weekend was the knowledge of what was coming." One woman brought a cello. A man played a harmonica. There were cocktails, pizza from her favorite local joint, and a screening in her room of one of her favorite movies, "The Dance of Reality," based on the life of a Chilean film director. Kelly Davis said she loved her sister's idea for the gathering. "Obviously it was hard for me. It's still hard for me," said Davis, who wrote about it for the online news outlet Voice of San Diego. "The worst was needing to leave the room every now and then, because I would get choked up. But people got it. They understood how much she was suffering and that she was fine with her decision. They respected that. They knew she wanted it to be a joyous occasion." Marilyn Golden of the Disability Rights Education & Defense Fund, said her heart goes out to anyone dealing with a terminal illness, but "there are still millions of people in California threatened by the danger of this law." "Dear rebirth participants you're all very brave for sending me off on my journey," she wrote in her invitation. "There are no rules. Wear what you want, speak your mind, dance, hop, chant, sing, pray, but do not cry in front of me. Oh, OK one rule." At one point, she invited friends to her room to try on the clothes she had picked out for them. They modeled the outfits to laughter. Guests were also invited to take a "Betsy souvenir" - a painting, beauty product or other memento. Her sister had placed sticky notes on the items, explaining each one's significance. "What Betsy did gave her the most beautiful death that any person could ever wish for," Alpert said. "By taking charge, she turned her departure into a work of art."